I. POSITION OF EARTHEN POT & LID. J. PERFORATED LID ON EARTHEN POT. L. DIA OF BRICK BATS. PERFORATED EARTHEN POT MAY BE SO PLACED OVER THE SOAKAGE PIT THAT WASTE WATER DROPS STRAIGHT INTO IT. IT MAY BE COVERED WITH PERFORATED LID TO PREVENT ENTRY OF REFUSE AND FIBERS INTO THE EARTHEN POT. 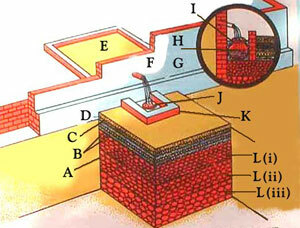 Excavate a pit (1 m. X 1 m. X 1 m.) near the wall of the house to construct a soakpit. Soackpit can absorb 10-15 buckets of useout water in a day. Fillup the excated pit with largest Brickbats at lowest startum, Medium one over it and smallest one at the top level keeping a space of 15 c.m. around the pit. Clay should not fall in during filling. Soackpit is based on filteration system, so the water is absorbed. Put the perforated pipe below the outlet pipe. Cover the layers of brickbats with Twigs and branches of plants of Cotton & Mehandi to be followed by Gunnybags, Clay and dry Soil. The Soakpit constructed by selfhelp and local materials will prevent the nuisance of Dirt and Mosquitoes.